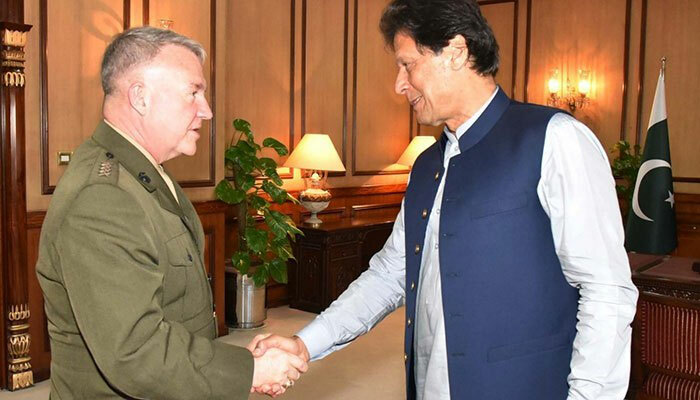 ISLAMABAD: Prime Minister Imran Khan was called on by the incoming commander of the United States Central Command (US CENTCOM) on Monday to discuss regional security and other matters of mutual interest. As per reports, the two VIPs met at the PM House on Monday and went into discourse regarding the progressing Afghan peace talks as well as the Pak-US relations. It was further reported that General McKenzie Jr. who took over General Joesph Votel last month as US CENTCOM head, had also met with Chief of Army Staff (COAS) General Qamar Javed Bajwa on Sunday at the General Headquarters where they discussed geo-strategic environment as well as regional security in light of the recent Indo-Pak tensions.